I figured I would start a seperate thread for this for the article itself, as that way those who do it can post their results here, and also those with any questions about it can post in here as well. Mods: If this isn't the right section please feel free to move this to the appropriate section. I just made a seperate page for the DIY that way you can print it off for handy reference if you choose to do it. Thanks to 604R32 for providing some of the pics used (rear cluster and rear surround pics) as I didnt' take any as I was doing this and he already had some from his FS thread Thanks bud! Old picture but if anyone was wondering what red looks like... Red was very slick and good for night vision, but it was sometimes hard to get a quick glance of the guage reading out the corner of my eye. The bulbs I got were complete crap though, flickering and burning out. $10 each is alright with me, I just need the proper color and blend in. I found the gauge cluster to be dim, but I can live with it, I'll just need to install the proper (or close) 74s in the lower section. I have (3) #74 red (non inverted) leds left over from mine if anybody wants them $5 shipped PM me. 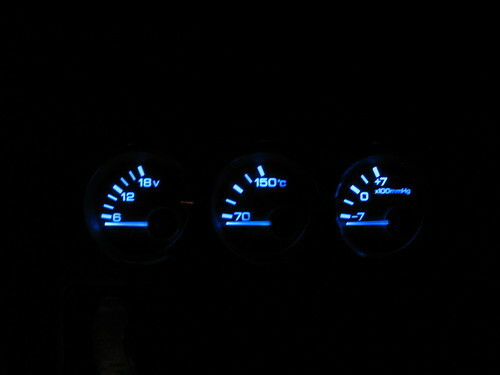 I put the inverted #74 ones in my cluster and they were almost the same for the 2 hot-spots. It is always worse with red. Guys who did theirs blue dont seem to get the hotspots. 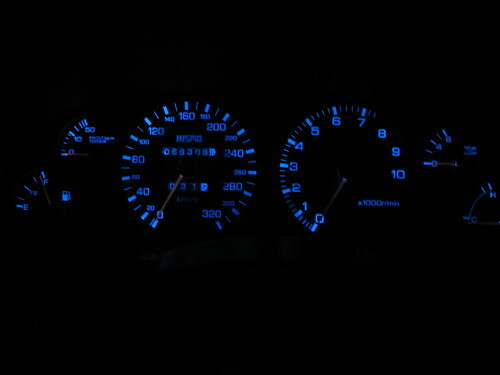 Anyone with a GTR and new lamps installed most likely noticed that there's 2 lower lamps which light up the 0 km/hr and the 0 RPM on the tach are still lit white if you got colors done. This is because the GTS doesn't have the same gauge cluster I guess. I went with red on my car and because everything was red and bright white in the bottom, which looked lame, I tried to install some (74-R which are the same as the center console lamps) but it actually made a hot spot that was twice as bright as the cluster lamps so in the end I simply removed the 2 lower lamps (they're in the blue holders at the bottom of the gauge cluster. I could be wrong but so far there's 3 GTRs that I've seen this issue... any one else got some feedback? The seller of they lamps doesn't own a GTR so he didn't know about this issue. any one know how green are the greens? tried this in amber and i think i bought the wrong bulb as mine is not bright enough..